Are you ready to take control of anxiety? Do you feel fed up with holding yourself back because you feel anxious in your daily life? Do you want to regain a sense of control, switch off negative thinking and grow your self-esteem? Get started with ten simple steps to shift perspective on any anxiety you are feeling. Most women typically experience some degree of low-level anxiety most of the time. This can peak into panic attacks, fears and phobias, and anxiety disorders during those times of crisis or stress. When you can understand more about what’s happening and how you feel, it helps you to take control. Did you know that a woman is twice as likely to suffer from anxiety compared to a man? It’s no longer enough to try and cope alone. The best way to overcome feeling stuck in a powerless and anxious mindset is to take action. Have you considered that your subconscious is using anxiety to let you know that the way you are thinking or acting in your life is out of alignment with who you are meant to be? Are you ready to give yourself the opportunity to take control of anxiety? If you’d like straightforward advice with how to cope better with and overcome anxiety in your life, then now is the time you can have the advice you need. 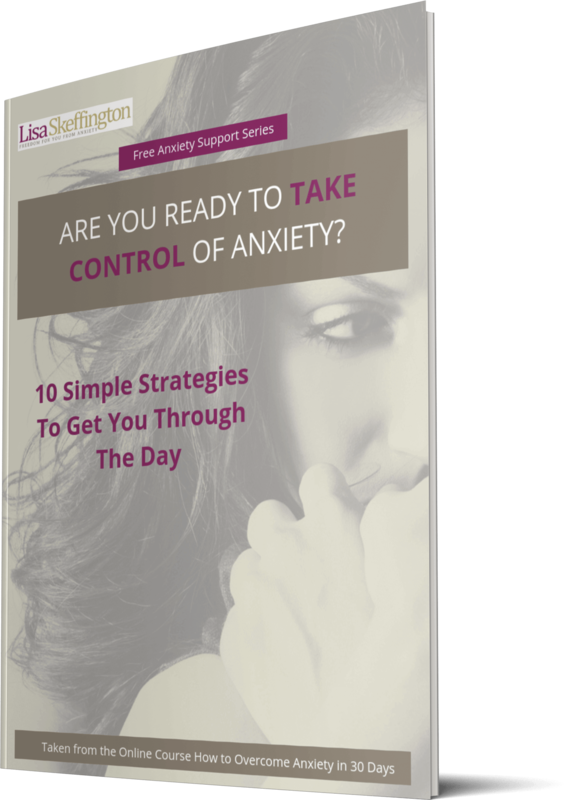 Download my guide "10 Simple Strategies to Get You Through The Day"
In addition to the free checklist download, you will receive a 7-step series of emails to help you start to take control of anxiety in your life. In the email there are 2 videos to help you understand more about anxiety and how you can take control of it. During the series you have the opportunity to reach out to me for further support and to tell me how you are feeling. If you are feeling confused and overwhelmed by the many different types of anxiety consultant and therapists out there with different approaches and personalities, I want you to know that I totally ‘get’ that it can be a minefield finding the right help. If you are a woman typically over 35 and you are struggling with feeling anxious and overwhelmed, you’ve come to the right place. You can be reassured that I am an experienced Consultant Psychotherapist and Advanced Hypnotherapist. As a Specialist in anxiety, I’ve been helping people like you to feel better about themselves for over fifteen years now. I specialise in all kinds of physical and psychological anxiety symptoms and I have developed a unique blend of therapies and mentoring/coaching methods to help you to take control, feel better and feel good! I broke free myself from the clutches of anxiety over twenty years ago. To know me now, you would think that I had always been super-confident and calm within myself but the truth is, I wasn’t always this way. Back then when I struggled with anxiety, which was all my life until my late twenties, I didn’t like who I was and I had no confidence in myself at all. Since that time, over the past eighteen years, it has become my life’s calling to have helped thousands of people, especially women, with help for anxiety. I have gained much experience, which means I can help you in the most efficient way. I feel it is my duty and my purpose to help you to find the resources within yourself, so that you too can find your own way to freedom and feeling good within yourself and about yourself, as I did. The good news for you is that it doesn’t have to be so hard. I can help you to heed the life lessons so you don’t perhaps make the same mistakes along the way that I made. I can help you to find your way quickly to loving yourself and creating a life that works for you on so many levels, so that you too can feel confident, empowered, happy and secure in your life, as I do now. Are you ready to take action today and overcome anxiety for a happier life? "Now I can get on with my life in a calmer and more positive way." "Knowing Lisa believed in me taught me how to believe in myself." You'll receive the checklist download with simple steps you can apply to get you through the day. You will learn how to use your breath to relax physically and ward off an anxiety attack. You will learn why women are more prone to anxiety. You will examine real life case studies and learn how others overcame anxiety. You will learn how you can start to feel less anxiety in your life. You will learn how it is entirely possible for you to take control and change things for the better with the right help. Looking forward positively to your next steps. Subscribe to receive my free Anxiety Email Series today and receive the series and ongoing helpful advice. Unsubscribe at any time. Please send me the series!